Venus sometimes appears as an evening star above the western horizon shortly after sunset and sometimes appears as a morning star above the eastern horizon shortly before sunrise. In primitive times, people regarded the evening and morning stars as two different heavenly bodies but in the sixth century BC, Pythagoras suggested that they might be one and the same body. 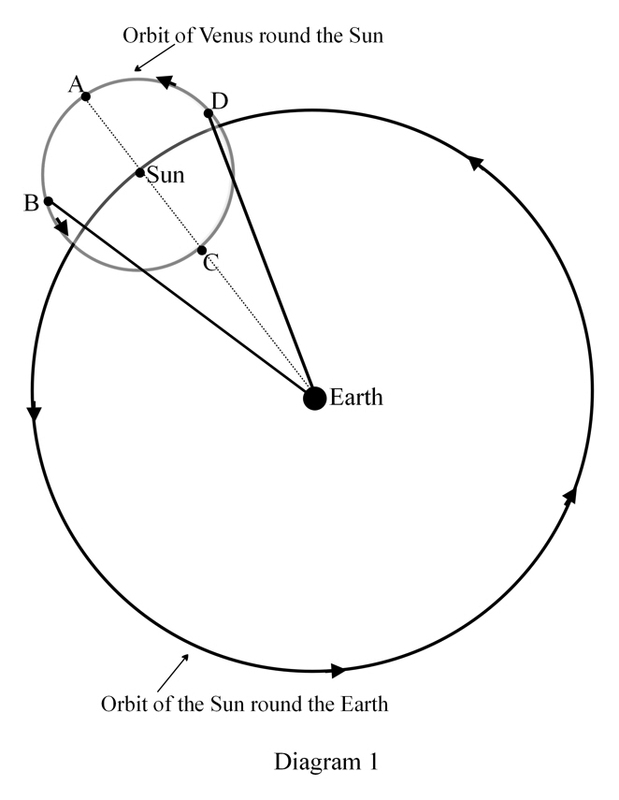 According to the Ptolemy, if Venus were at a point in its orbit somewhere on the semicircle ABC, say at B, then the line joining the Earth to Venus would be to the left of the line joining the Earth to the Sun. Therefore, looking from Earth, Venus would appear to be to the left of the Sun so, when the Sun sets in the west, Venus would be seen for some time after sunset above the western horizon as an evening star. In a similar way, if Venus were at a point somewhere on the semicircle ADC, say at D, it would appear from Earth to be to the right of the Sun and it would therefore appear above the eastern horizon just before sunrise as a morning star. The average distance of Venus from the Sun is 108 million Km. while the average distance of Earth from the Sun is 150 million Km. Because the circumference of the orbit of Venus is smaller than that of the Earth, we can safely assume that Venus takes less time to complete its orbit than the Earth does. Whereas the Earth moves through 360o in 365.25 days, Venus completes its orbit in 225 days. For this reason Venus gains 0.6o per day on the Earth and overtakes it at intervals of approximately 600 days. From the diagram it will be seen that, after Venus has overtaken the Earth (that is after it has passed the point V) it becomes a morning star. It increases its angular distance to the right of the Sun until it reaches 44o at point X. After passing X, the angular distance to the right of the Sun decreases until it reaches point Z, which is behind the Sun. After passing Z, it makes its appearance to the left of the Sun and is now an evening star. As it approaches Y, its angular distance left of the Sun increases until it reaches 44 o at point Y. 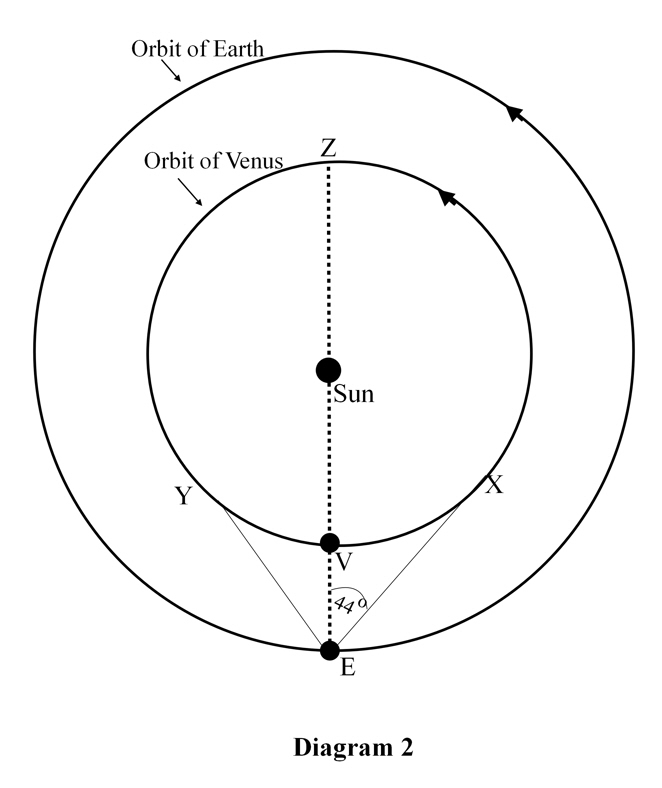 After passing Y on its way to V, its angular distance left of the Sun decreases until, at V, it is zero when it will pass either slightly above or below the Sun. On extremely rare occasions, it crosses in front of the Sun and this is known as a ‘transit of the planet’. To sum up, Venus overtakes the Earth at intervals of approximately 600 days. During approximately 300 of these days, it is a morning star and for the other 300 days, it is an evening star. The maximum angular distance right or left of the Sun, is roughly 44o. What about Mercury? In a similar way, Mercury is also an evening and a morning star. Mercury is the closest planet to the Sun and because it has the most elliptical orbit, its distance from the Sun ranges from 29 million Km. to 47 million Km. Because the circumference of its orbit is comparatively small, it gains 3o on the Earth per day and overtakes it on average every 120 days. For 60 of these days it will be a morning star and for the other 60 it will be an evening star. Its maximum angular distance left or right of the Sun is roughly 24o. So Venus and Mercury are both morning stars and evening stars but it is quite easy to tell them apart for the following reasons: Venus usually appears much higher in the sky than Mercury and is far brighter; in fact, Venus is the third brightest object in the sky after the Sun and the Moon. In-depth coverage of this and similar topics can be found in the book Astro Navigation Demystified.